Note: This ISBN includes both the PhysioEx 9.1 lab manual AND the PhysioEx 9.1 CD. Please visit www.physioex.com for different ordering options. 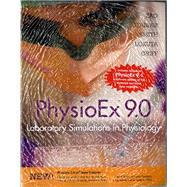 PhysioEx™ 9.0: Laboratory Simulations in Physiology with 9.1 Update is an easy-to-use laboratory simulation software and lab manual that consists of 12 exercises containing 63 physiology lab activities that can be used to supplement or substitute wet labs. PhysioEx allows you to repeat labs as often as you like, perform experiments without harming live animals, and conduct experiments that are difficult to perform in a wet lab environment because of time, cost, or safety concerns. PhysioEx 9.1 features input data variability that allows you to change variables and test out various hypotheses for the experiments. 9.1 retains the popular new improvements introduced in 9.0 including onscreen step-by-step instructions and “Stop & Think” and “Predict” questions that help you think about the connection between the experiments and the physiological concepts they demonstrate. "For anyone taking physiology and anatomy required coursework, I recommend PhysioExâ„¢ 9.0: Laboratory Simulations in Physiology with 9.1 Update, which is an excellent text to support or supplement wet labs The text has 12 easy-to-follow exercises and 63 lab activities that offer self-paced convenience and other benefits, such as the ability to repeat the labs as many times as desired, as well as not harming live animals during the experiments and reduced cost and potential safety issues that can arise in live wet lab environments. The 9.1 update allows the student to change input variables to further test hypotheses, and includes the original features of the 9.0 version such as Stop and Think and Predict questions to help deepen students' understanding of the material along the way. Easy to use and follow, highly recommended"
PhysioEx 9.1 Laboratory Simulations in Physiology book with PhysioEx 9.1 Update CD: 5 out of 5 stars based on 1 user reviews.